Well the regular season is done, depressing isn't it. 20 teams have shut down for the year and either patted themselves on the back for a nice try or cried long and hard into the night. Plenty of players will begin to thing about where they'll be next year, if they'll retire or not or whether or not they've made the cut for the Associated Press awards. But before that there are more important awards to hand out. 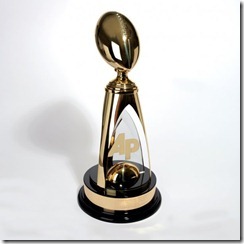 The Pulling Linemen's first annual award. Ok, so it's not as prestigious as many others out there, but we're sure that the winners will give it pride of place on their CV's. Probably. No, we’re not going to be glib and give it to Peyton Manning. In a season where 4 QBs threw for enough yards to fit into the top 6 single-season passing yard totals, the MVP category was always going to be QB dominated. 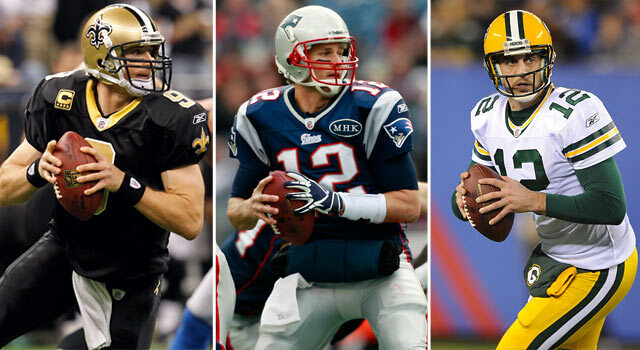 By our votes, the men who threw for the 1st and 2nd most yards in a single season in NFL history, Drew Brees and Tom Brady, come in at 2nd and 3rd respectively in the MVP race. Normally, this would stink of fixed voting, but when the winner is Aaron Rodgers, you just have to accept that the stats don’t tell the full story. Rodgers finished the season 5th in total passing yards, and 2nd (just 1 behind Brees) in TDs thrown with 45, but when you watch the Packers play it’s like no-one has ever played QB before, and Rodgers has invented the whole thing and kept the secret of it to himself. Only 6 INTs in 15 games is impressive, especially when you throw it 33 times a game, but hitting up to 12 different receivers in a game, leading your team to an (almost) undefeated regular season, and doing it all whilst your D is bottom of the NFL in a number of categories is unrivalled. Some might say Matt Flynn breaking a number of Packers franchise records with his performance in week 17 takes some of the shine away from Rodgers’ season, but not us. Sure, the receiving corps the Pack have can make any QB look good in a one off game, but even a Hall-of-Fame, All-Star set of receivers couldn’t make a decent QB into Aaron Rodgers. in the NFL today, and every defensive back. Injures to Andre Johnson, and poor Quarterbacks for Larry Fitzgerald left Calvin Johnson all alone in the “best WR in the game” conversation. And boy did he revel in the role. There are few players in the whole league that are as physically gifted as Calvin Johnson, or as humble. The myriad of diva wide receivers in the NFL, who celebrate after every play and throw their toys out of the pram at every opportunity (I’m looking at you DeSean Jackson, Stevie Johnson and Santonio Holmes) is staggering, but Calvin stays classy. He was excellent when he came into the NFL but underused due to Detroit’s quarterback situation, but after a full season with Matthew Stafford we’ve seen just what Megatron can do. Get used to it folks, he’s gunna be around for a while. Our runners-up Ray Rice and Rob Gronkowski both excelled at their positions too. Rice basically carried the Baltimore offense, which is one of the most Jekyll & Hyde units in the NFL. He came up big in their week 1 shellacking of Pittsburgh and carried on from there. His importance was highlighted in the Ravens week 10 loss in Seattle. Rice carried the ball just 5 times in a game which was never really out of hand, it was almost as if offensive coordinator Cam Cameron just plain forgot about his Pro Bowl running back. If the Ravens are to fully come out from the shadow of their bitter rivals Ray Rice will be a big reason why. As for Rob Gronkowski, he comes 3rd in our voting despite an impassioned argument from me that he should be higher. It was a record setting season for the 2nd year man, with new tight end marks in both yards and touchdowns. He was almost uncoverable all year, too big for defensive backs and too fast for linebackers, and once he had the ball he was almost impossible to bring down. The Gronk left a trail of bodies behind him and craters in the endzone after each one of his trademark spikes. But it’s not just his receiving skills that have him making our top 3. He is a fantastic blocker as well, dominating almost every defender who tries to get past him. Job one for every AFC defensive coordinator this off season will be figuring out how to stop this 6 foot 7 behemoth. Jared Allen has a mullet, and yet he’s still the best thing about the Minnesota Vikings (well, that has 2 fully operating knees). Allen is one of the few elite pass rushers in the NFL who play the run just as well as the do the pass which is one of the reasons we voted him so high. The fact that he finished just 0.5 sacks off tying the single season record when he had an utterly terrible defense around him and not a single other serious threat on the defensive line is a testament to his talent. If only he’d been playing Brett Favre in the final week he’d have that sack record to himself. Terrell Suggs had a rather inconsistent, but much hyped season. His 14 sacks represent a career high but he has just 3 multi-sack games (wk 1 vs PIT, wk 12 vs SF, wk 14 vs IND) and 8 games where he failed to register a sack. That’s not the kind of consistency a serious defensive player of the year candidate wants. But thanks to Gur and Phil he makes our final 3. Suggs is a ball-hawk of a player and his 7 forced fumbles are not by accident. When Suggs gets around the QB he has a habit for swatting the ball out even if he’s been well blocked. Skill like that is hard to come by and a nightmare for tackles to cope with. You might be surprised by the inclusion of Vince Wilfork here, but you really shouldn’t be. We’re linemen, and appreciate the physicality and grit needed to play in the interior of the line, and like everyone else we love to see big men with the football. And there are few bigger than Vince Wilfork. His interceptions against San Diego and Oakland were 2 of the best plays of the season, and they weren’t accidents or lucky deflections like most lineman INT’s. Wilfork read the play, recognised the running back sneaking out and went to cover him, then made good plays on the ball to come away with turnovers for a defense that is desperately short of playmakers. Nose tackles don’t rack up the stats, they rack up double teams. And Vince Wilfork is one of the best at absorbing them and staying firm. He usually gets a good interior push on passes as well. He’s an all-round great player who rarely gets the credit and applause he deserves. Despite doubts about how quickly he could transition to the NFL, the Panthers drafted Cam Newton with the first overall pick; all Newton gave in return was arguably the greatest rookie season by any quarterback in the history of the league, shattering records left and right, and perhaps as importantly, Newton has rejuvenated a Panthers fanbase that had suffered through an atrocious 2010 campaign; whether or not he has been iconic, he has certainly been entertaining. a lot of fun for us. Over in Cincinnati, the Bengals followed up an equally shambolic 2010 season with a massive turnaround resulting in a playoff berth; and while a strong defense played a large part in the Bengals' success this year, there is no question that a ton of credit fall on the shoulders of rookie WR-QB duo A.J. Green and Andy Dalton. Green has unquestionably lived up to the hype surrounding him when he entered the draft, routinely making circus catches, one-handed grabs, passing the 1000 yard marker in his rookie season and proving a dangerous weapon for fellow rook Andy Dalton. While Dalton hasn't been a record-breaking QB like Cam Newton, Dalton has one thing to his resume Newton doesn't – a winning record, and a place in the playoffs. Without a strong run game to balance out the Cincinnati offense, Dalton responded to the challenge, taken reasonably good care of the ball (14th best interception percentage) while throwing the 13th most touchdowns (20), and guiding the team to postseason football. The 49ers have the no.2 seed in the NFC. The 49ers have Alex Smith as their starting quarterback. These two sentences seem incompatible – until you realise just how good the 49ers defence has been. San Fran have the best front seven in the NFL, and rookie Aldon Smith has played a huge role in making the Niners D both dominant and dangerous. His 14 sacks lead all NFL rookies, and that on its own is impressive; but when you realise that he's put up that stat line despite not yet starting a game in the NFL and that he had never played linebacker before this season (being a defensive end in college) AND that he didn't even have a full offseason to help him transition to the pro game, let alone to a brand new position, the mind truly boggles and what this kid can do. While he hasn't had as many sacks, Von Miller has arguably been more important to the Denver defense (you know, the guys who are actually responsible for the Broncos turnaround midway through the season). Unlike Aldon Smith, Miller started every game he played in this season; and while he was benched earlier in the season, as he struggled in the run game earlier on, he has been dominant down the stretch, racking up double digit sacks despite playing outside linebacker in a 4-3 defence. Miller also put up 65 combined solo tackles & assists, four pass breakups and three forced fumbles, and will be a centrepiece of the Broncos defense for years to come. 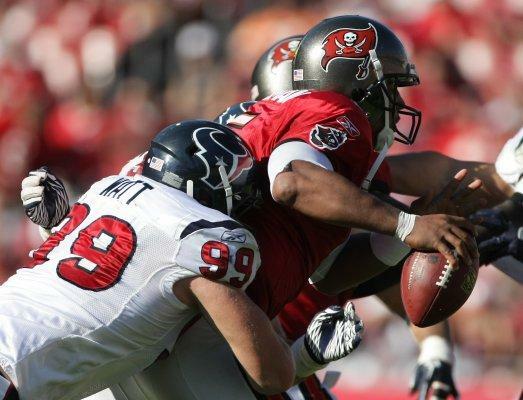 DE J.J. Watt was part of a massive turnaround with the Houston Texans, going from the 30th ranked defence in 2010 to the no. 2 defense this season. While he hasn't put up the best stats, he still managed to contribute 5.5 sacks; but his contribution has come more from what the stats don't show – he has been solid in the run game, plugging holes, and he has been able to consistently put pressure on opposing passers, leading to big plays by his team mates. Being a defensive lineman in a 3-4 D isn't always the most glamorous or headline-grabbing job, but it is often the difference between a successful and porous defence. In Watt, the Texans have found the engine of their D for the foreseeable future. A tough category to grade, as these units are often considered as a team rather than individuals, and it’s hard for a good O-lineman to shine if the guys around him are horrible or the people they’re protecting have no talent (see Ryan Clady). However, our votes have settled on 2 pro-bowl tackles and a centre that has been key to one of the best O-lines in the NFL this season. Jason Peters has been revitalised at LT for the Eagles this season. It has shown in Shady McCoy’s excellent season, and despite the Eagles being nowhere near the “dream team” we expected, Peters has cemented himself as a key, if less glamorous, piece for this team moving forward. The Houston running game is incredible. Don’t get me wrong, Arian Foster is a great runner, and Ben Tate is pretty decent too, but they would be seriously limited if they were setting off behind a line like the Rams or Cardinals. The lynchpin of the Texans OL is centre Chris Myers, who has had another excellent year, despite the fact he’s been (wrongly) overlooked for the pro-bowl again. It’s hard when you have to compete for AFC votes with Maurkice Pouncey and Nick Mangold, but seeing as both of these guys have missed time due to injury this year, and Myers hasn’t missed a start in 4 years in Houston , it’s about time Myers got given his due. Our nod for #1, however, goes to Joe Staley. However the 49ers have done it, they have turned it around from constant under achieving to #2 seed in the NFC, and Staley and the 9ers line can take a lot of the credit. Keeping Alex Smith upright, keeping Gore healthy and rumbling, and catching a 17 yard pass are not easy jobs for one player to do, but Staley has managed it this season. His overall performance has earned him the #1 spot in our list, and a starting role for the NFC in Hawaii. Well deserved. In his rookie year JPP was used sparsely and allowed to come along slowly. This frustrated a lot of Giants fans, but it certainly paid dividends this year. Pierre-Paul is a very rare athlete with a fantastic blend of speed and strength and his play this year has people seriously talking about him as a Defensive Player of the Year candidate. While that might be a bit premature this season his is a name that you’ll hear in that discussion for many years to come. At 23 he’s going to get better and better, particularly in his run defense and in the way he sets up pass rush moves. The Giants have a strong tradition of pass rushers, and JPP is already adding to that. Jason Pierre-Paul is one of the big reasons the Giants won the NFC East despite a brutally tough 2nd half of their schedule. Another was the play of Victor Cruz. After making a name for himself in 2010’s Hard Knocks for his pre-season performance against the Jets a hamstring injury kept him out for most of the 2010 season. But injuries to Manningham and Hixon at the start of this season gave Cruz a chance to prove he was more than a 1 hit wonder. And did he ever. The undrafted free agent from UMass set a franchise record for receiving yards this year, finishing 3rd in the NFL. He’s made a habit of making big plays this season, with 5 of his touchdowns being over 65 yards, including a stunning 99 yard catch and run against the Jets in week 16. The big stage doesn’t seem to scare him off either, on Sunday’s Win Or Go Home game against Dallas Cruz took over the show, making 6 catches for 178 yards and breaking a long touchdown. Having 2 players on this list bodes very, very well for the future of the G-Men. Our 3rd player has done something that hasn’t been seen for a long time, lead the Detroit Lions to the play-offs. With no running game to speak of and a leaky defense Matthew Stafford needed every one of those 5,038 yards to get the Lions a wild card spot. Yes they were helped out by injuries in Chicago, but despite a 2-5 wobble in the middle of the season the 3rd year QB was able to live up to his 1st overall selection at last. 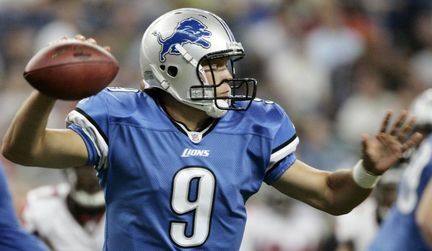 Better offensive line play was a big reason behind Stafford being able to stay healthy, and having Calvin Johnson on the outside will help anyone look good, but Stafford is the biggest reason that people see Detroit as a dark horse for these play-offs, and real contender for years to come. This category is an easy one to sum up: Record breaking, ridiculous, and responsible (as in more responsible for Denver’s playoff berth than Tebow). David Akers broke the record for field goals kicked in a season, with a grand total of 44. It’s an amazing total, almost 3 per game, but is less surprising when you consider the 49ers had one of the worst Redzone possession-to-touchdown ratios in the league. Still, nothing can be taken away from a record breaking season, and he capped it off with an 11 yard passing TD to a wide open Michael Crabtree in week 17 against the Rams. It’s for this reason Akers gets the nod at #1. 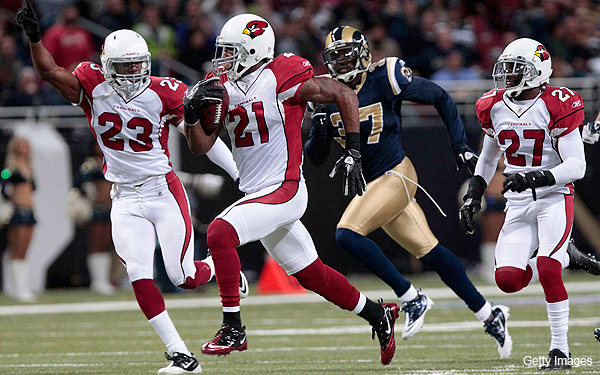 Patrick Peterson is ridiculous. He’s had a decent season at corner for the Cardinals, but has had a huge season in the return game. 4 return TDs, including an OT, game-winning 99 yard punt return against the Rams in week 9, and then another one against the same team just 3 weeks later, ties Peterson for the NFL record in one season. Denver has plenty of people to thank for their remarkable run to the playoffs this season. Elvis Dumervil and Von Miller for terrorising QBs, Willis McGahee for keeping a lacklustre running game ticking over, the forever young Champ Bailey shutting down half a field. But perhaps above all these players, Denver should be thanking Matt Prater. In the “Tebow Time” run, before the bandwagon broke down, fell apart and caught on fire, Prater connected on last-second, game-winning FGs in 3 straight games against San Diego (37 yards, after a missed Chargers FG and a 24 yard run from McGahee), Minnesota (23 yards, after an Andre Goodman interception) and Chicago (51 yards, after a Dumervil forced fumble) [I include the situation of each FG to highlight the lack of Tebow’s input]. 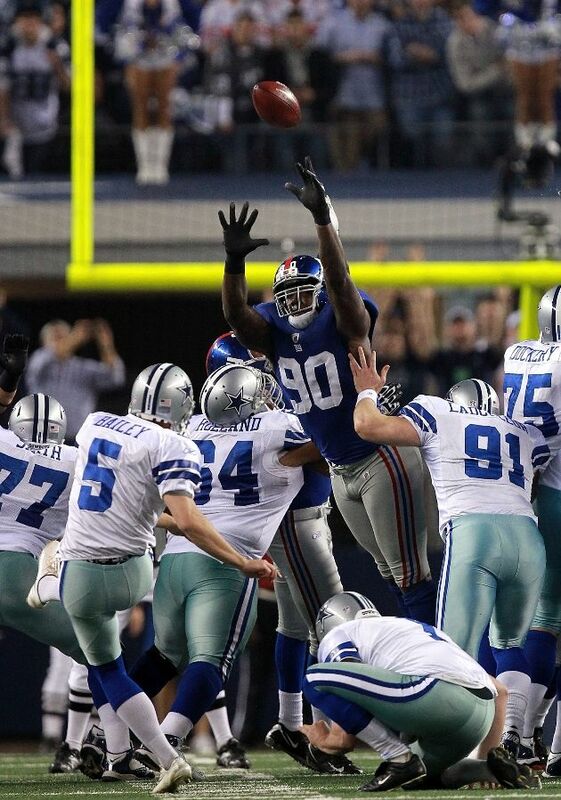 That kind of clutch kicking is huge, and would have won Dallas the NFC East if they had someone as good. As it is, Denver has slumped into the playoffs thanks to Prater’s previous run of magic, and earns him the #3 spot. 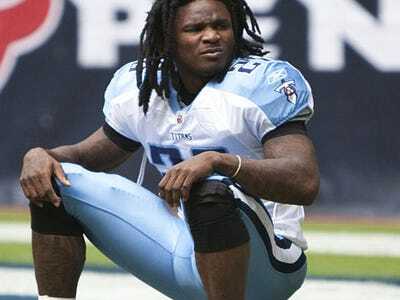 Chris Johnson may have rushed for 2000 yards in 2009, but we all knew that he'd probably never reach that milestone again; still, it was a reasonable expectation that he should be routinely threatening to rush for 1500 yards a season for at least the next few years. However, when Johnson decided to hold out over what little offseason there was over a contract dispute, it was clear that he might struggle for the first few weeks before returning to his former self. Instead, Johnson turned in a putrid season. It might not show up from the stat sheet – he still rushed for over 1000 yards and averaged 4.0 yards per carry, though both were still career lows – those stats are inflated by huge games against the Bucs (32nd ranked rushing defence) and the Bills (28th ranked rushing defence). Hell, all three of the Pulling Linemen could have a huge game rushing against the Bucs. If you exclude those games, Johnson's yards-per-carry drops to a more accurate 3.26, which would place him last amongst all starting running backs (even with those inflated games, his 4.0 average is second worst). Furthermore, Johnson only had 4 rushing touchdowns – the least amongst every running back in the NFL who started all 16 games this season; all-in-all, a terribly disappointing season by Johnson. In the run up to the 2010 draft, one of the biggest points of debate was which quarterback should be drafted first overall, Sam Bradford or Jimmy Clausen. In the run up to the 2011 draft, one of the biggest points of debate was which quarterback should be drafted first overall, Cam Newton or Blaine Gabbert. Both debates were rendered utterly moot before the conclusion of these quarterbacks' first season in the league. 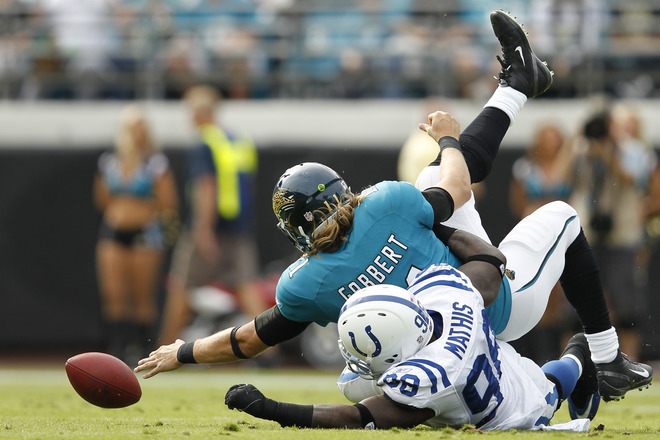 Like Clausen the year before, Gabbert sat for two games before atrocious QB play forced them onto the field. Like Clausen, Gabbert performed so terribly at quarterback that the team that drafted him will have to seriously consider drafting another quarterback in the upcoming draft. Forget the incredibly average stats (50.8% completion percentage, 5.4 yard per pass attempt, 65.4 passer rating), most damning is how lost he looked on the field, how terrified he appeared of the slightest threat of a pass rush. Maybe he was forced into action too early, but when you were in the conversation for first overall pick, performing as poorly as Gabbert has is, quite frankly, embarrassing. DeSean Jackson has been described as one of the most explosive players in the league; that was true, until this season. Another NFL player unhappy with his contract situation, Jackson also held out for the opening days of training camp, but returned to team facilities before he was liable to be fined for missing practice – at least, physically. Mentally, he has been absent throughout the whole season, being deactivated for one game as punishment for missing team meetings, and seeming stubborn and insolent on the sideline – with the NFL Network memorably showing a clearly vacant Jackson staring absently into the distance while quarterback Vince Young was attempting to talk to him during a loss to the Seahawks on Thursday Night Football. There is no question that Jackson has rare talent that, combined with his blistering speed, could see him become one of the elite receivers in the NFL; but with his unfocused mental effort and an apparent lack of effort – either due to insubordination over his contract situation, or just a simple lack of maturity – Jackson may have half-asses his way out of the big payday he so desperately wanted.